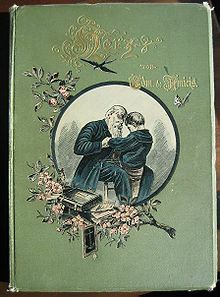 Cover of Herz, an 1894 German translation. Heart (Italian: Cuore [ˈkwɔːre]) is a children's novel by the Italian author Edmondo De Amicis who was a novelist, journalist, short story writer, and poet. The novel is his best known work to this day, having been inspired by his own children Furio and Ugo who had been schoolboys at the time. It is set during the Italian unification, and includes several patriotic themes. It was issued by Treves on October 18, 1886, the first day of school in Italy, and rose to immediate success. Through its investigation of social issues such as poverty, Heart shows the influence of left-wing ideologies on De Amicis' work (he was later to join the Italian Socialist Party). Because of this, the book remained influential (and the staple of many textbooks) in countries of the Eastern Bloc. On the other hand, the book's strong evocation of Italian nationalism and patriotism also made it very welcome in Fascist Italy. The novel is written in a diary form as told by Enrico Bottini, an 11-year-old primary school student in Turin with an upper class background who is surrounded by classmates of working class origin. The entire chronological setting corresponds to the third-grade season of 1881-82 (Enrico says it has been four years since death of Victor Emmanuel II, king of Italy, and the succession by Umberto I, and also tells about the death of Giuseppe Garibaldi, which happened in 1882). Enrico's parents and older sister Silvia interact with him as written in his diary. As well as his teacher who assigns him with homework that deals with several different stories of children throughout the Italian states who should be seen as role models – these stories are then given in the book as Enrico comes upon reading them. Every story revolves around a different moral value, the most prominent of which are helping those in need, having great love and respect for family and friends, and patriotism. These are called 'The Monthly Stories' and appear at the end of every school month. Enrico Bottini: Narrator and main character. Average student who is keen to learn things and meet people in his classroom. Mr. Alberto Bottini: Enrico's father. Stern yet loving. He works as an engineer. Mrs. Bottini: Enrico's mother. Traditional homemaker, loving yet tough. Silvia Bottini: Enrico's older sister. She also cares for him and his studies, once selflessly foregoing going out with girlfriends to take care of him while he was sick in bed. Enrico and Silvia's unnamed younger brother who studies under Ms. Delcati. Does not have much input on Enrico's diary, since he cannot talk down to him like the other family members do. Antonio Rabucco: Known as "the little stonemason" because of his father's job. He is the youngest boy in the class. Ernesto Derossi: The class' perennial champion, he wins the top medal in the class every month. He is a natural learner who doesn't need to study much. Despite his prowess, he is humble and not haughty. Garrone: Friendly tough guy. He protects his weak classmates Nelli and Crossi, and as the oldest boy in the class is the de facto enforcer. Pietro Precossi: Son of a blacksmith who beats him. At one point his father stops beating him and studies enthusiastically enough to earn the runner-up medal in the class. Carlo Nobis: Haughty because his parents are rich. However, his father forces him to apologize to Betti when Carlo insults Betti and his coal miner father. Stardi: Derossi's perennial medal challenger along with Votini. He likes reading books though he doesn't own many of them. Betti: Son of a coal miner. Votini: Top contender to the top medal, at one point others make light of his envy of Derossi. Crossi: A red-head with a paralyzed arm. Often victim of bullies. Nelli: Hunchbacked and also bullied because of it. Garrone becomes his protector. Coraci: Dark-skinned boy from Calabria, in the south of Italy. Garoffi: Son of a pharmacist, he deals on toys and trading cards on the side whenever he can. Franti: Bad student, all-around jerk who bothers people, hates learning and his classmates and teacher, and laughs at sad situations. He has been expelled from another school before and is expelled from the school after he lights a firecracker that causes a huge explosion. Mr. Perboni: The teacher. A kindly and affable man who rarely gets angry, but who is stern with his students when they do wrong. He is a lifelong bachelor who considers his students his family. Ms. Delcati: Enrico's previous grade teacher, she now teaches his little brother. The novel was translated into Chinese in the early 20th century (with the title "愛的教育" – literally The Education of Love) and became quite well known in East Asia. It was translated into Spanish with the title, Corazón: Diario de un niño meaning Heart: Diary of a Child. The book was very popular in Latin countries, such as Mexico, among young boys and girls in the 1960s and 1970s. The novel was also extremely popular and influential in 1950s Israel, though at present it is considered rather old-fashioned and no longer well-known to the current generation of young Israelis. In 1887, a sequel, called Testa (Head), was written by neurologist Paolo Mantegazza, Amicis' friend, which narrates the life of Enrico in his teens. In 1962, Umberto Eco published Elogio di Franti (In Praise of Franti) viewing Franti, the "bad boy" of the novel, as a figure of resistance against militarist and nationalist ideology. One of the two teenage characters in the film I Prefer the Sound of the Sea (2000) reads Cuore and has a job in a bookshop named Franti. The book has been used as one of the inspirations for academic achievement in Mexico, having used the name of the author for one of the world schools of the International Baccalaureate called Instituto D´Amicis, located in the city of Puebla. In 1948, it was made into a film, directed by Vittorio De Sica and Duilio Coletti. One of the stories, "From the Apennines to the Andes," became the basis of the 1976 anime series 3000 Leagues in Search of Mother. The series consisted of 52 episodes and was broadcast in the World Masterpiece Theatre. The whole series was viewable in many different languages, and became popular all over the world. In conclusion to the series, a movie was released in 1980 that was later remade, also as a feature film, released in 1999. Cuore itself was later adapted in its entirety by Nippon Animation, as the 26-episode series School of Love: Story of Heart (愛の学校 クオレ物語, Ai no Gakkō: Cuore Monogatari) in 1981. This series was also broadcast on Italian TV as Cuore. School of Love: Story of Heart was very popular in Iran for the generation born after the Iranian Revolution. The series name, which was broadcast in Iran several times, was changed to Students of Alp Mountains (ت). In 1984, a television miniseries based on the novel was produced by RAI and directed by Luigi Comencini. In 2009 Heart: Diary of a Child was created as an audiobook by Carlos Acosta in English and Spanish languages (see external links). This page was last edited on 17 March 2019, at 22:51 (UTC).